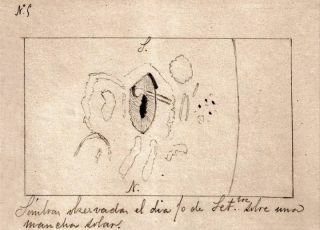 Juan Valderrama y Aguilar's drawing of the solar flare he observed on Sept. 10, 1886, on a sunspot (with the darkest region in black and the less dark area shown with hashed lines). The solar flare is the tadpole-shaped feature in the drawing. The original document is currently at the Library of the Canary Islands Astrophysics Institute. Recently, Spanish astronomers found the writings of a little-known teenager who made an incredible contribution to the study of the sun. More than a century ago, 17-year-old Juan Valderrama y Aguilar turned to his notebook to draw a powerful white-light flare that was blasting off the sun's surface and casting a shadow near a sunspot, all visible to him through a small telescope. This marks the third-earliest recording of a white-light solar flare in history, according to a statement from the Spanish Foundation for Science and Technology. "White-light flares correspond to the most extreme cases of [solar flares], where so much energy is dumped into the chromosphere and corona that the energy propagates downward to the photosphere, heating it up and producing the excess brightness that we observe in white light," Jorge Sánchez Almeida, of the Canary Islands Astrophysics Institute, said in the statement. Images of the solar surface, as seen by the Hinode Solar Optical Telescope before and during a white-light solar flare on Dec. 14, 2006. Sánchez Almeida and his fellow researchers at the Canary Islands Astrophysics Institute and the University of Extremadura, both located in Spain, recently located Valderrama's drawing, which is the third recorded instance of a white-light flare..
Valderrama's amateur observations were just the beginning of his career in astronomy, and according to the statement, the young man would go on to become the director of the meteorological observatory of Santa Cruz de Tenerife in the Canary Islands, where he was born. To make his observation, Valderrama used a neutral density filter to dim the sunlight shooting into his telescope, and with a modest aperture of 6.6 centimeters (2.6 inches), he watched the spectacle unfold over the course of a day. "A huge, beautiful sunspot was formed," Valderrama wrote, according to the statement. "[B]y looking at it carefully, I noticed an extraordinary phenomenon on [it]: a very bright object ... producing a shadow clearly visible on the sunspot penumbra." Valderrama sent his data to the French journal L'Astronomie, where it was published soon after.. The findings are incredible because white-light flares are rare, the researchers said, and because he observed the unique solar event despite being young and operating with limited technology. "[T]he white-light flare observed by Valderrama is, chronologically, the third one recorded in the history of solar physics," José Manuel Vaquero, a lecturer at the University of Extremadura, said in the statement. The first solar flare was recorded in 1859 by British astronomer Richard Carrington, and Italian astronomer Pietro Angelo Secchi described the second flare in 1872.